Much has to be done. Johnny needs a new shirt. There are at least 20 steps involved in home manufacture of cloth. Most children master ten. A settler keeps enough sheep to make yarn for the family’s clothing – usually five or six but a big family may require a flock of 20 animals. One out of ten is a black sheep for dark wool. Wild predators are a problem in this wilderness. The young girls have to keep an eye on the flock while using a hand drop spindle called a “rock” to make tightly twisted yarn. They pick up pieces of lost wool from the ground and bushes or hand pick from the sheep. Shearing is done after “lamb in” and before “turnout” to summer pastures. The sheep are run through the creek for a wash before shearing. The shorn wool is washed again in heated water and spread on bushes to dry. Wool fleece is stripped of its natural oils by soaking in water and homemade soap made of animal fat and lye leached out of household fire ashes. An unwashed fleece left “as is” has waterproof qualities. Wool in summer, flax in winter. A walking wheel is used for wool and a Saxony Wheel is used for flax. A good spinner easily walks the equivalent of 20 miles a day and makes six skeins of yarn. The spinning wheel never stops. All in the household learn to spin, but the unmarried women, called spinsters, spend their days spinning. Flax is a long thin stem with little blue flowers. Plants are pulled by hand. The seed pods are combed off to provide seeds for next year. Stalks are dried and “retted” – spread in the weather until the leaves rot off. Then the stems go to the flax brake, a wooden machine that separates the woody part of the stem from the fibre. This is called “swingling” or “scutching”. Then the tangles are combed out or ““hackled”. Different sizes of combs hackle progressive degrees of fineness. The finer the thread the finer the linen. There is a country blend of textiles called “Lindsey-Woolsey” which combine the warmth of wool and the toughness of linen. It is strong, warm, durable and receptive to dye. Once popular and common in earlier times, Lindsey-Wollsey was eventually replaced by cotton as it became easier to acquire. Fleeces are sent to carding mills and yarns to weavers if there is one close to the community. Sometimes a travelling weaver stops in to trade for fibre. In early times, the settlers were self-sufficient. If there were mills in the area, fleece would be wrapped in sheets and held closed with thorns. A fleece was carded once for yarn or twice for weaving. Spun yarns were then ready for dye. Most colours were made with natural vegetables dyes, roots, berries, bark, lichen. The bright colours of red and blue were purchased. Red Cochineal (crushed bugs from South America). Blue Indigo (plant of the tropics). Often a bride receives imported dyes as a wedding gift. Every household had a wooden dye tub steeping in the corner of the kitchen by an open fireplace. With a board on top of the tub it is a cosy place to sit but you must be careful not to tip and fall in. You can probably imagine little Johnny tipping into this at one time or another, but most of us made due with natural colours. 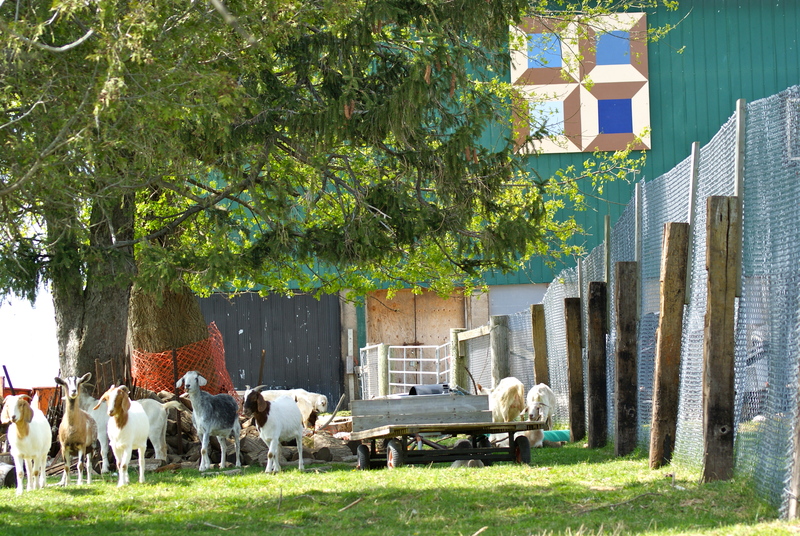 Posted on June 4, 2012, in History, HERstories, and Myths, Longwoods Barn Quilt Trail and tagged settlers in Ontario, spinning, weaving, wool. Bookmark the permalink. Leave a comment.